All Criterion sleeping bags feature down-filled tailored cowl hoods which are comfortable and warm. The drawcord requires just a one-handed pull to draw it snugly about your head. 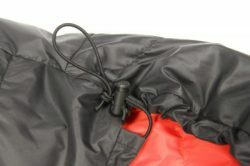 In both the Ultralight and Quantum ranges the hood’s drawcord is elasticated. In 2010 we modified the hood design in part of our range to make it fit more snugly. This improvement affects our large sleeping bags: Criterion Traveller, Criterion Prime and Criterion Lady. In 2017 we changed the design of the hood in the Criterion EXPEDITION sleeping bags to improve heat retention around the head in extreme conditions. The drawcord toggle systems allow for one-handed closing of the hood cowl and neck baffle. This also applies to the drawcord on the stuff sack. The drawcords on the hood and neck baffle are different to make it easier to identify them by touch when in use on a dark night. The toggles are metal-sprung for durability. 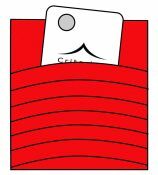 In addition to the Velcro for the neck baffle mentioned in point 2. above, all Criterion sleeping bags also have a velcro closure/flap for the sleeping bag itself. This allows you to close the bag without having to zip it all the way up to the top. This is a really useful facility if you get too warm and want to provide extra ventilation without opening up the whole of the sleeping bag at the top. In 2010 we modified the shape of this flap to give it a more stylish, curved appearance. As with the neck baffle, this velcro fastener has a secondary strip to prevent unwanted “bits” catching in the hooks. The Box Foot creates a “mummy” shape, which gives plenty of room for your feet. This is especially useful when the sleeping bag is used whilst you are in “full gear” on a freezing night at high altitude. The overall shape of the Criterion Box Foot is that of a trapezium, with the bottom wider than the top. It is designed to conform to the position of your feet when you are lying on your side, with both sets of toes pointing in more or less the same direction. 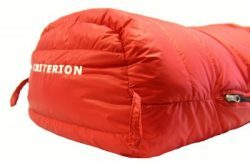 The Criterion Lady sleeping bags incorporate a Polar Fleece insert within the Box Foot, for additional warmth and comfort. 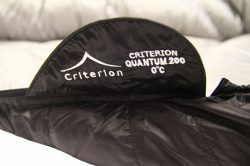 Criterion sleeping bags are longer than some competitors’ standard sleeping bags. This means that sleeping on your front with your toes pointing downwards presents no difficulty. Down sleeping bags need to be fully dried out after use for which hanging is the ideal treatment. Strong hanging loops are stitched in at the foot. For extra comfort and convenience each model has an easy-to-use internal pocket. All Criterion sleeping bags have full-length YKK zips, our bags are all available in both left and right-handed configurations. 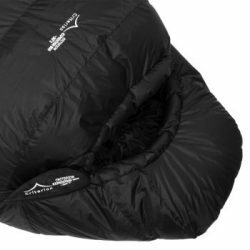 All of our sleeping bags, with the exception of our Expedition range, can be zipped together to form a double sleeping bag (please note that in order to do this left and right-handed models are needed. 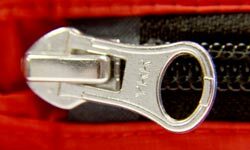 Zips are of the two-way type, which means that they can be unzipped from the top (as standard), and also from the bottom, which allows the box foot to be ventilated in warmer conditions. In addition, the zips have self-locking sliders to prevent accidental opening.